Mary lived on Three Cherry Trees Travellers Site in the 70s/80’s before moving into a house(in Three Cherry trees Lane) she shared with a friend after her husband Henry’s death. My mother Daphne Clark was social worker/warden of the county council owned site. This picture was taken in 1940 by Lt.R.Allen Shuffrey who was commander of the LG guard. He lived at Leverstock Green Farm. The lady in the foreground in the left is his wife who had been to visit the travellers. 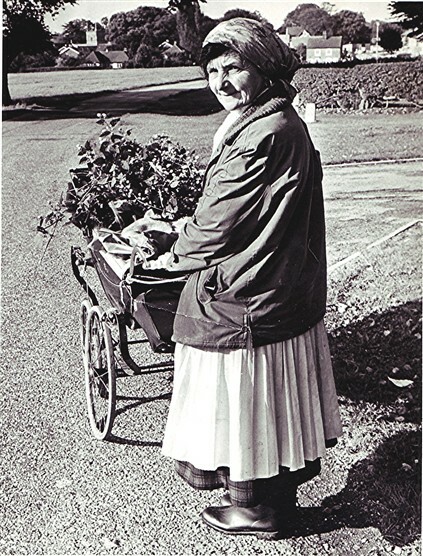 The photo features in my book “Archive Photograph Series Leverstock Green and Bennetts End” published in 1996. One of the favourite spots for the travellers was Market Oak Dell off Bedmond Road. Other gypsies including these camped near to where Green Lane meets Buncefield Lane and Westwick Row. Another favourite spot was the area arond the water tower off Blackwater Lane. Information supplied by Barbara Chapman.